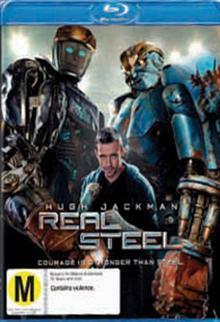 A gritty, white-knuckle, action ride set in the near-future where the sport of boxing has gone high-tech, "Real Steel" stars Hugh Jackman as Charlie Kenton, a washed-up fighter who lost his chance at a title when 2000-pound, 8-foot-tall steel robots took over the ring. Now nothin... read full description below. A gritty, white-knuckle, action ride set in the near-future where the sport of boxing has gone high-tech, "Real Steel" stars Hugh Jackman as Charlie Kenton, a washed-up fighter who lost his chance at a title when 2000-pound, 8-foot-tall steel robots took over the ring. Now nothing but a small-time promoter, Charlie earns just enough money piecing together low-end bots from scrap metal to get from one underground boxing venue to the next. When Charlie hits rock bottom, he reluctantly teams up with his estranged son Max (Dakota Goyo) to build and train a championship contender. As the stakes in the brutal, no-holds-barred arena are raised, Charlie and Max, against all odds, get one last shot at a comeback.